Fossils are really interesting things, and we can learn so much from them. Here we’re going to take a look at what fossils are and we’ll give you some awesome facts on fossils that we bet you won’t know, unless you’re all clued up on fossils already! Before we go into what fossils are, it’s important to know what palaeontology is. 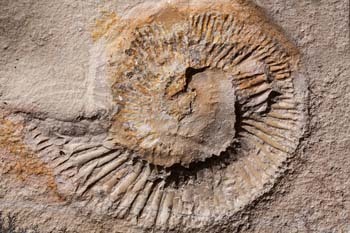 It is basically a part of biology that studies all forms of life that existed many, many years ago, and most of what a palaeontologist does is study fossils. So they’re really important when it comes to fossils. Palaeontologists carefully remove fossils from the ground and record all the details about where and how the fossils were found. This helps us understand why the living organism may have died and why it may have been found in this particular location. The only way that we’ve been able to learn about dinosaurs, and still do, is by studying fossils. They are the relics of ancient animals and plants, or the traces or imprints of living things from many, many years ago. Fossils also might show traces of their activities. Fossils have been found on every single continent of Earth. That’s cool; it would be great to actually look at fossils. 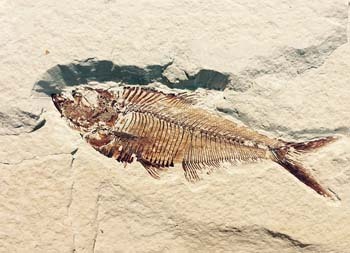 The word fossil comes from the Latin word ‘fossilis’, which means, ‘dug up’. That’s certainly correct as most fossils are literally dug up. They are excavated, or dug up from sedimentary rock layers. But what is sedimentary rock? It is a type of rock that has been formed from sediment, like sand, mud and small pieces of rock. Over long, long periods, these small pieces of debris are squeezed and they get buried under more and more layers of sediment that pile up high on top of it. Eventually, they are squeezed into sedimentary rock. Now this is quite something. The fossil of a bone doesn't have any bone in it! 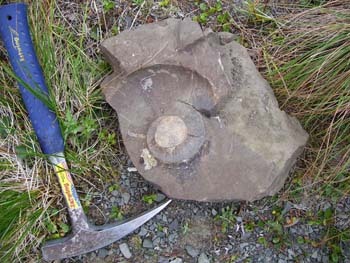 A fossilised object is the same shape as the original object, but is more like a rock. We guess it’s all those years of being under rocks that they’re like this! Some animals were quickly buried after their death, for example if they sank in the mud or were buried in a sandstorm. As the years go by, more and more of that sediment that we spoke about covers them up. Some parts of the animals didn’t rot, normally bones and teeth, and they were covered in newly formed sediment. If there were no scavengers, or any quick burials or too much weathering, then parts of those objects turned into fossils over time. 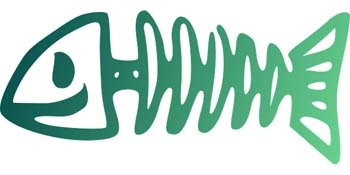 After a long time the animals bodies changed due to some chemicals. As bones slowly started rotting, water that had minerals in it seeped into the bone and replaced the chemicals turning the bone into rock-like minerals. Fossilisation is the process where the original object is dissolved and the original minerals are replaced with other minerals. In the end you get a heavy, rock-like copy of the original object; and that’s what we call a fossil. The fossil has the same shape as the original object, but is actually more like a rock! That’s quite some process it goes through. Firstly, let’s give you a definition of petrification. It is a process in which matter that has been living is exposed to minerals over a long period of time and these are turned into a stony substance. Petrification can save hard and soft parts and slowly replaces the living material with silica, calcite or pyrite, forming a rock-like fossil. Wood is often found petrified. Some organisms are surrounded in amber, which is a hardened form of tree sap. Here you’ll normally find pieces of insects or plants. Fossils of imprints may form, like a big cast of a dinosaur footprint. That would be awesome to take a peek at. The impressions, if all goes well, fill with sediments that fossilise. Most animals didn’t actually fossilise, they mostly decayed so we know nothing about them. Palaeontologist’s estimate that only a small percentage of the dinosaurs that ever lived have been or will be found as fossils. At least we know quite a lot about them already. Scientists study the facts about each and every fossil they find so they can find out where the animal might have lived, what they ate, how old they were and how they died. Can you believe that a fossil can give us so much information? Dinosaur bones which are found by palaeontologists are mostly petrified, which we explained earlier. The largest single fossil ever found was a petrified tree. It was found in Thailand and was over 72m long. Scientists estimate that the tree would have been over 100m tall when it was living. That’s a very high tree. Imagine trying to climb it? The largest dinosaur fossil found was nearly 34m dinosaur called the Argentinosaurus. It was found in central Argentina. That’s one pretty long dinosaur. No marine dinosaur fossil has ever been found. Fossils are found on every continent on Earth including Antarctica and at the top of Mount Everest near the highest point on Earth! The presence of fossils indicates that most of the Earth was covered by water at some time. Wow! So there’s everything you need to know about fossils. Maybe you should go out hunting for some fossils and see if you can find anything. Get all your gear ready! Copyright 2017 Science for Kids. All rights reserved.